Android phone stalwart Samsung has announced record profits for the first three months of this year, profits driven by its flourishing smartphone sales. Samsung reported [PDF] revenues of $4.45 billion, an 82 percent jump from the same period in 2011. While it's widely agreed that Samsung has surpassed Nokia as the largest seller of cell phones in the world, the Korean company's status as the King of Smartphone sales isn't as clear cut. Samsung, you see, likes to keep its cell phone sales numbers close to its vest, so those numbers are, at best, educated guesses. For Samsung's total cell phone sales during the period, most of the guesses place Samsung ahead of Nokia; for smartphones, it's a mixed bag. Even when estimators generally agree, however, their estimates can vary widely. For example, ABI pegged Samsung cell phone shipments for the quarter ending in March at 83.4 million -- a slim 700,000 more than Nokia's reported 82.7 million. Meanwhile, Strategy Analytics guessed that Samsung shipments were 93.5 million, greater than 10 million more than Nokia. Shipment estimates for Samsung smartphones also varied, but showed less consensus. Strategy Analytics, for instance, crowned Samsung King of Smartphone sales, with 44.5 million units shipped. 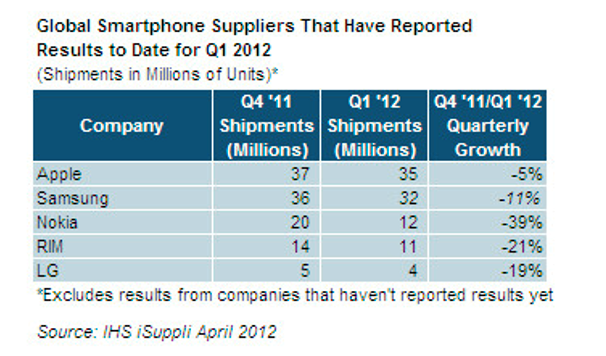 On the other hand, iSuppli pegged March quarter shipments at 32 million, which would make it an also-ran against Apple. What makes the situation even murkier is that the analysts are making guesses about shipments, not sales. 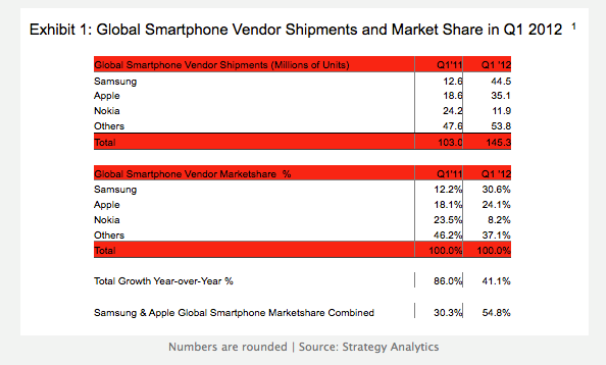 Apple's smartphone numbers for the period are for sales. That makes smartphone comparisons between the two companies akin to comparing apples to oranges. So when Apple says it sold 35.1 million iPhones during the March quarter, those are phones paid for and in the hands of consumers. When an analyst says 44.5 million Samsung smartphones may have been shipped during the period, those phones were sent to distributors, but how many of them ended up in consumers' hands is another question to be answered. It's not uncommon for companies to avoid releasing sales figures. Such figures could be used by competitors to obtain some kind of advantage. Neither is it uncommon for companies to release shipment numbers, rather than sales figures, because companies almost always ship more of anything than they sell. In the past, Samsung has released smartphone sales figures, although even those figures were confusing because the company mixed smartphone and tablet sales together. After it started skirmishing with Apple in courts around the world over patent infringements, it stopped the practice. During an earnings call on Friday, Samsung executives declined to comment on its standing versus its rivals, according to the Wall Street Journal.